Click to listen to episode (2:44). From the Cumberland Gap to the Atlantic Ocean, this is Virginia Water Radio for the week of November 12, 2012. This week, we drop in on a rich Virginia cultural tradition—a Saturday-night square dance—where calls of “Duck for the oyster!” got dancers talking about a key part of Virginia’s rich aquatic-wildlife tradition! Sound unlikely? Well, just have a listen for about 50 seconds. You’ve been listening to Blacksburg-based string band The Jugbusters playing at a recent community dance, while several dancers called out some of the duck species found in Virginia. About 25 kinds of ducks occur regularly or occasionally on the Commonwealth’s ponds, streams, wetlands, and coastal waters. They include dabblers, like Mallards, which feed from the water surface; divers, like mergansers, which submerge below the surface to feed; and sea ducks, like the Bufflehead, which spend part of their life over marine areas. 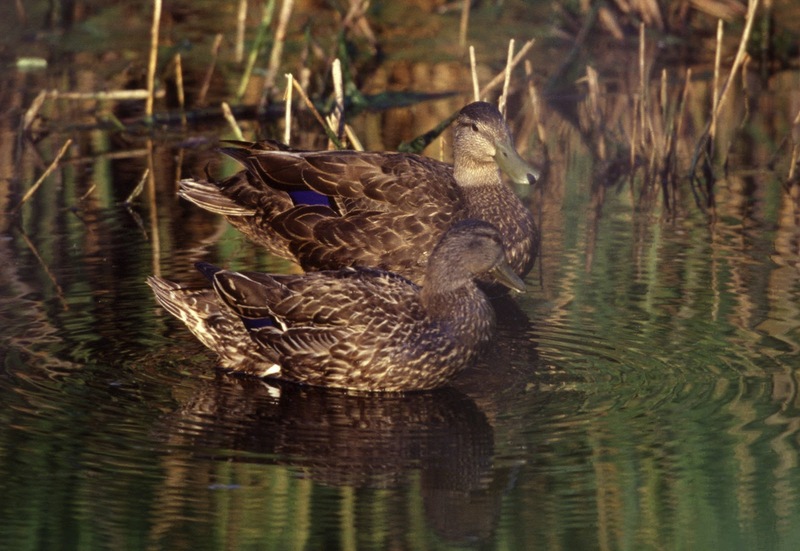 Some ducks can be found year-round in Virginia, but most species are winter residents, migrating to spring breeding grounds in Alaska, other northwestern states, Canada, or Greenland. Whenever they land in the Old Dominion, ducks are as Virginian as an old-time string band. Thanks to The Jugbusters and our duck-name callers for permission to use this week’s music and sounds. Black Ducks. Photo made available for public use by the U.S. Fish and Wildlife Service's National Digital Library, online at http://digitalmedia.fws.gov, accessed 11-12-12. Acknowledgments: Music in this episode was performed by Blacksburg, Virginia band The Jugbusters during a November 10, 2012, dance in Blacksburg, and the names of ducks were spoken by people attending that dance; all used with permission. More information about The Jugbusters is available at their Facebook page, https://www.facebook.com/thejugbusters. 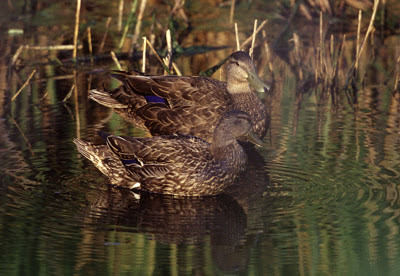 Information on ducks was taken from the “Wildlife Information” Web page of the Virginia Department of Game and Inland Fisheries, at http://www.dgif.virginia.gov/wildlife/, which includes the March 2010 “Official List of Native and Naturalized Fauna of Virginia”; this database provides maps and detailed accounts of the range and present distribution of each species in the database (as of 11/12/12); the U.S. Fish and Wildlife Service’s Web site “Waterfowl ID,” online at http://www.flyways.us/duck-identification-resources (as of 11/12/12); Life in the Chesapeake Bay, by Alice Jane Lippson and Robert L. Lippson (Baltimore: Johns Hopkins University Press, 2006; and A Guide to Field Identification of Birds of North America, by Chandler S. Robbins et al. (New York: St. Martin’s Press, 2001). *Cornell University Lab of Ornithology’s “Bird Guide” Web site at http://www.allaboutbirds.org/guide/search, and the Cornell lab’s “Birds of North America Online” at http://bna.birds.cornell.edu/bna. Both Cornell sites include photos, distribution maps, recordings of calls, and ecological information on birds throughout the Western Hemisphere; a subscription is required to use the “Birds of North America Online” site. *E-bird Web site at http://ebird.org/content/ebird/, maintained by the Cornell Lab and the Audubon Society. Here you can find locations of species observations made by contributors, and you can sign up to contribute your own observations.